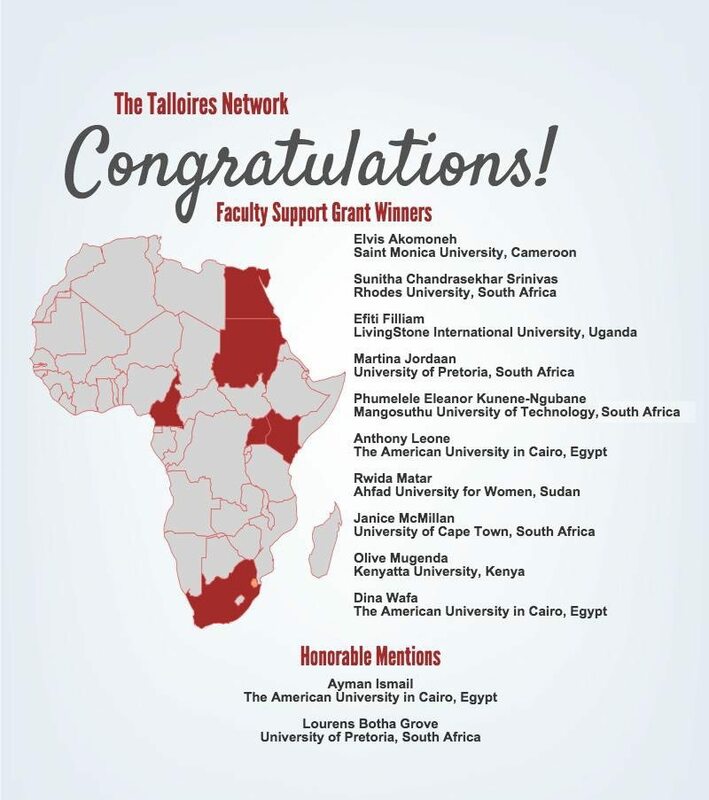 In partnership with Mastercard Foundation, the Talloires Network launched the University Education for Transformative Leadership in Africa (UETLA) Faculty Support Grants. 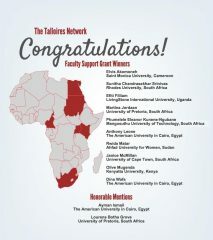 We are pleased to host an international Selection Committee that chose the 10 grantees and two honorable mentions from a pool of 28 applicants in Africa. The cohort represents some of the most unique and innovative programs in university-community engagement. Download the UETLA Program Report! Saint Monica Health Center Franchise Project, in partnership with the Ministry of Public Health in Cameroon. The project was initiated in September 2013 and aims at developing a franchise system, whereby graduates of the Saint Monica University (SMU) nursing and physician assistant programs will be able to establish health centers across the country, especially in underserved areas, thereby providing much needed health care in remote areas, while providing jobs for these health care professionals and strengthening the local economy. This initiative focuses on the Millennium Development Goals which address infant and child mortality and maternal health in South Africa. The program identifies maternal health issues of women in rural villages and seeks to provide educational interventions for healthy mothers and children. This innovative internship program gives Ugandan students opportunities to gain relevant experiences in their career field and exposure to determine if they have genuine interest in the field. It gives students the opportunity to have a “hands-on” experience with modern and contemporary practices in a dynamic economic work environment. This is a flagship module of the Faculty of Engineering, Built Environment and Information Technology at the University of Pretoria. It is an eight-credit module (80 hours) offered on an open-ended and project-orientated basis. It gives all undergraduate students a structured, educationally sound experience in community engagement, service-learning and reciprocity with a community organization. Learn more on the program YouTube and Facebook. Founded in 2013, the project encourages students to be involved with community initiatives on a voluntary capacity. It seeks to create graduates who are responsible and conversant in community ethics. This annual project involves four academic courses with a semi-annual conference on civic engagement held at a partner university in Beirut, Lebanon. The project, which includes the Quartet and the Conference, all work together to enhance the opportunity for students to become active citizens who are agents for community change. And the project represents a manifestation of the sincere belief in the relationship between good scholarship and human development. This program prepares students of all levels with soft skills to effectively interact with people from diverse backgrounds. The ethical leadership component teaches student to examine their views, values and biases in order to respond effectively to situations arising from diversity in their communities. It offers skills training to promote positive interactions and create awareness and encourage the use of community resources. Founded in 2010 as a commitment by the University of Cape Town to grow active, global citizens with a commitment to work for social justice, citizenship and leadership. The programme aims at inculcating transformational leadership skills and positive attitudes in young people, in preparation for their life after school. This is done by encouraging innovativeness and the ability to adapt in the world outside class and the vision to create own opportunities to advance both self as well as others in the society. This program strengthens economic advocacy of students at all levels in Egypt and the Arab region, focusing on access to information, creating a participatory approach and public policy reform. V-lab was established as an entrepreneurial incubator for students and non students that educates youth leaders in the form of entrepreneurs principles of running a startup successfully towards becoming effective and successful global citizens using university faculty and facilities. This experiential learning course enables students to engaged practical legal experience in nearby communities by providing free legal services.